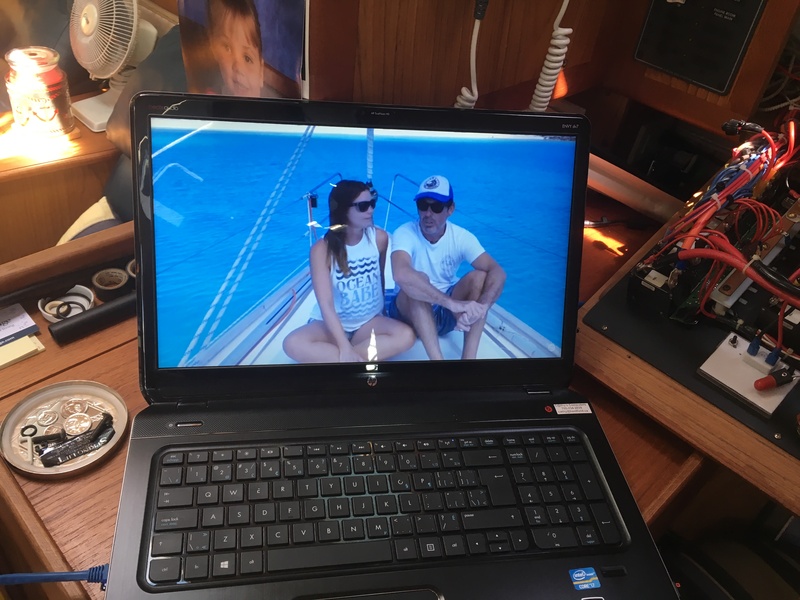 The joy of leaving the dock and disconnecting from the world is one of the great pleasures of boating, but in the fast-paced world we live in today, completely detaching from technology can be difficult. Gone are the days when you could leave on your annual boating vacation and truly be unreachable. Now, you almost always want access to friends, family and Netflix (maybe also clients or the boss). So how do we stay connected to binge watch our favorite programs or just keep the kids quiet? The answer: Wi-Fi and cell signal boosters. With the cost of gas and overall maintenance fees associated with boating, many boaters end up spending a lot of time at the dock. If you are a member of a marina, or a transient boater docking for the night, you can make use of the marina’s Wi-Fi network to retrieve emails, surf the web or watch a movie. Your location in the marina and the equipment you have to grab the Wi-Fi signal will dictate how strong of a signal you get. One way around this is to use a Wi-Fi booster. The use of a proper booster can dramatically increase your range to connect to that hot spot—even being as far as 15 miles away. There are a few companies like Aigean and Wave WiFi that are leading the way in this field. 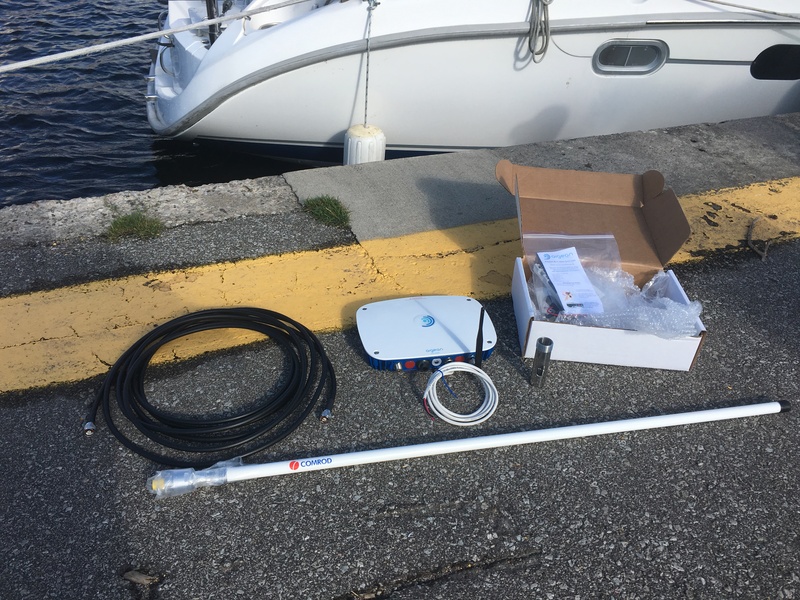 Installation of these units are fairly straight forward and can be done by the average boater. One afternoon we tackled the installation of an Aigean 2000 unit and documented the process. 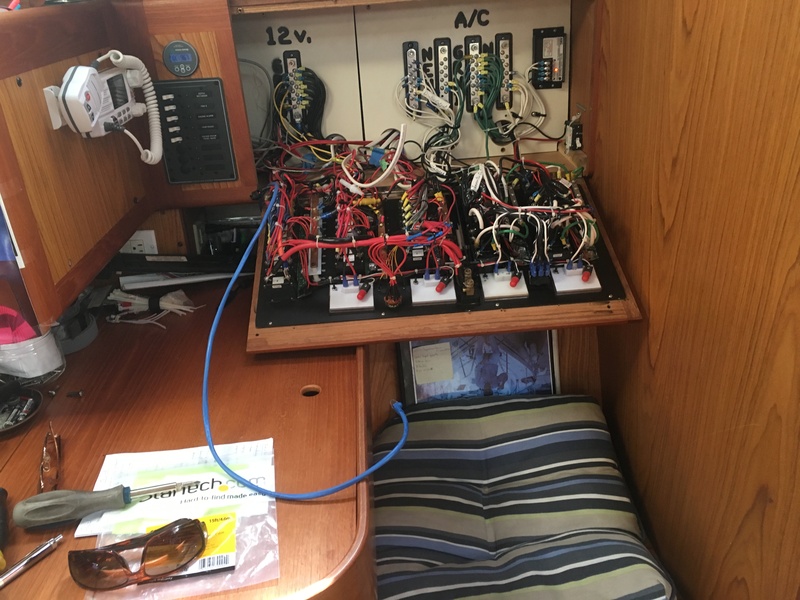 The install took place on the sailboat Storm Rider. From start to finish, it took us approximately six to eight hours to install. First, we laid out all the components and decided where they would go. For the outdoor antenna, we mounted it on the aft pole that is intended for a radar or satellite dish, but accommodated the Comrod antenna quite nicely. The owner was getting a stainless fabricator to permanently install the antenna. Second, we needed a place for the Aigean device (hub). The final location for the hub would be next to the navigation table in the salon. This location gave us good separation from the antenna and allowed us to run a short Ethernet cable to the laptop that was being used. You can also add a wireless router in the system for the ability to jump onto your local hotspot with any device. Next up we had to run cabling from the antenna to the hub. This always proves to be the most difficult part of the install as you can run into many obstacles such as bulkheads and tight corners. Also, note that some of the cabling can be fairly large depending on the system you choose so get those hole saws ready. We powered the unit from a 12-volt electrical panel (obviously, fusing it) and secured it to a shelf over a closet. Set-up was an absolute breeze and I can’t think of anybody that couldn’t get this up and running. Once we had it going on the laptop, we tested its range. The installation took place roughly a mile away from the marina’s hot spot, so that gives you an idea of this monster’s power. We tested email and general web browsing with no lags at all, then it was onto the video. We pulled up YouTube and to our delight it was streaming as if we were in our house. Suffice to say, I was impressed as was the owner. Finding a cell signal out on the water can be a little touch and go. It’s frustrating to keep losing calls underway. One way to avoid dropped calls is to install a cell phone signal booster. With Wi-Fi boosters, you always have to be in range of some sort of hot spot. 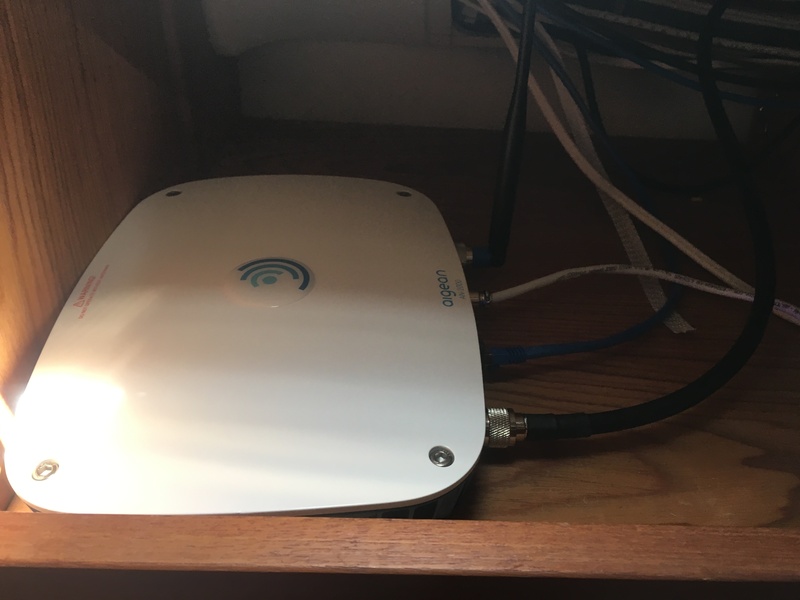 Cell signal boosters work in the same way, but no password is required and streaming video with cellular data can get quite costly. Similar to the installation of the Wi-Fi booster, the cell booster has an outside antenna, inside antenna and cabling system. The critical installation concern is to get the separation between the outside antenna and the inside antenna. If they are too close to one another, oscillation occurs (interference created by two antenna sources). It’s important to note is that the cell booster will not boost a signal that is not there. In order to boost the signal, you must have at least one bar. No bars? No signal. Typically, with a good booster and a good installation, you can boost one bar up to four. A lot weighs on the actual installation. Companies like Shakespeare and Wilson Amplifiers have marine ready systems. Whatever your needs, you have options to get connected and stay connected. To make and receive calls, then a cell booster is probably what you need. 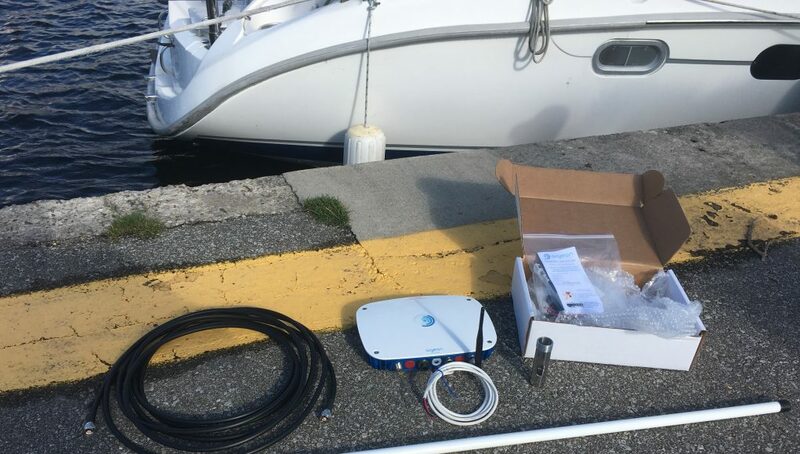 To spend some evenings at the marina streaming your favourite program, a Wi-Fi booster may be best. For the best of both worlds, go ahead and get both. This article was featured in the 2017 Fall Issue of Boats&Places.